Latin America shines as a region with immense potential for accelerating the spread of solar power. Its many emerging economies are an everincreasing source for demand, while the political climate across the continent is overwhelmingly in favor of renewable energy. International stakeholders are flocking to become part of the next big wave of renewable investment, prepared to face the challenges of developing projects in a still-nascent market. 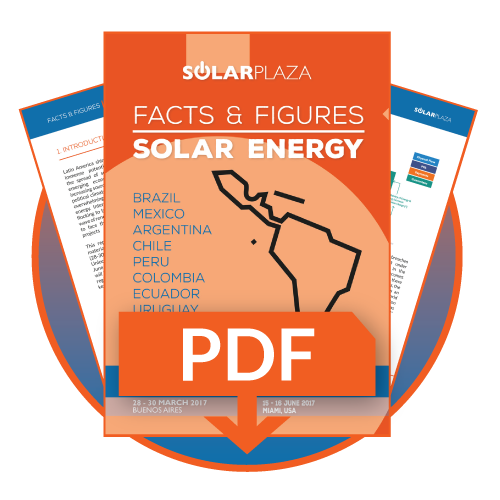 This report serves as complementary material to the El Futuro Solar Argentina (28-30 March, Buenos Aires) and Unlocking Solar Capital: LATAM (15-16 June, Miami) conferences Solarplaza will be organizing in the Latin American region. It provides an overview of the key facts and figures related to some of the key markets in Latin America. You will find extensive overviews of the following countries and regions: Brazil, Mexico, Argentina, Chile, Peru, Colombia, Ecuador, Uruguay, Central America and the Caribbean.